CAP2's dynamic campaign seems to have piqued the interest of a few people so I thought it was time to post some information about it. 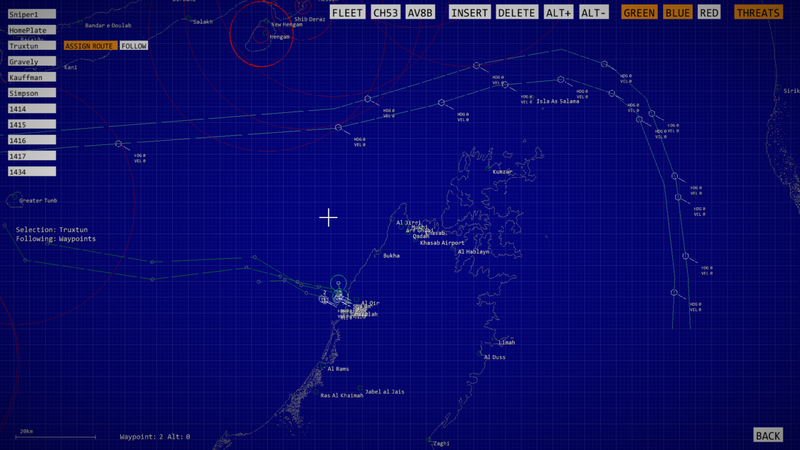 A basic feature of CAP2's dynamic campaign is persistent world state between missions. This state includes unit positions, orders, armament levels, damage, fleet waypoints etc and is saved after each mission. A major feature of the campaign is dynamic mission generation. This is reactive to enemy actions, previous mission results and your overall strategy, e.g. if you move your fleet closer to the Strait to be closer to the action then more of your missions will involve fleet protection from air and surface attacks. In addition to the dynamic campaign missions there are predefined missions which are 'blended' into the mission cycle. 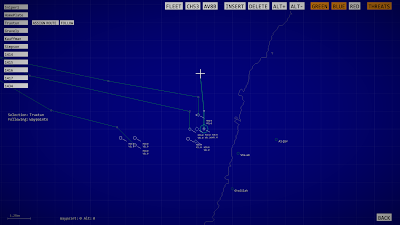 Before each mission you can access the mission planner which allows you to adjust the number of aircraft in the mission package, weapon loads and the auto generated aircraft waypoints. 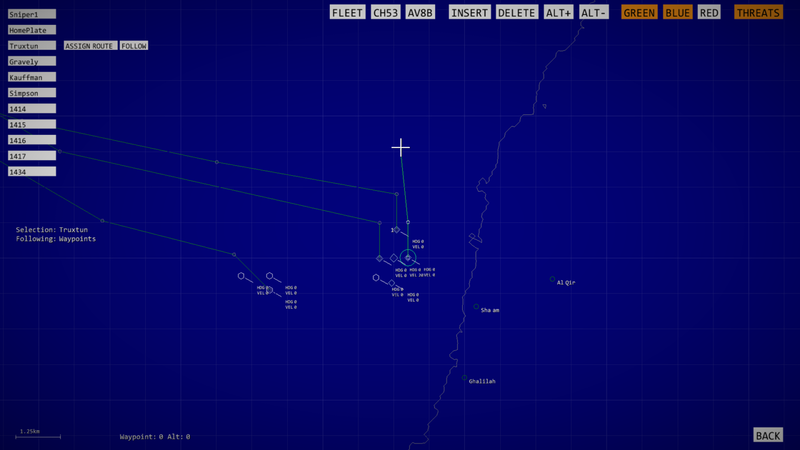 You can also alter your persistent fleet waypoints. This includes assignments to individual ships so if you want to send a couple of frigates out as 'radar pickets' or take part in a combined air and sea bombardment of an island then you have that capability. 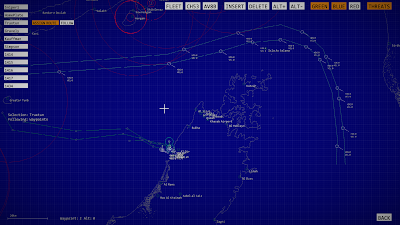 Here are a couple of shots of the mission planner..
You can see the merchant maritime traffic following sea lanes through the Straits. You must protect these throughout the campaign. If you cannot protect them and declare the Straits closed this will count towards campaign failure. There are numerous strategies you can follow within the campaign which leads to a significant amount of replayability(is that a word?). So, do you close the Straits on day one? Focus on the islands? Send the fleet to the Straits? Keep the fleet together? It's up to you.